Full or partial tooth loss, if left untreated, doesn't just affect a person's self-image — it can also increase the risk of developing nutritional problems and other systemic health disorders. Fortunately, there's a reliable and time-tested method for treating this condition: full or partial dentures. Dentures are just one option for replacing missing teeth; some of the others include fixed bridgework and dental implants. Each method has its particular pluses and minuses, which should be carefully considered. There are also several varieties of dentures available to address specific issues, from partial dentures to implant-supported overdentures. The best option for you will depend on your individual situation. How Do Removable Dentures Work? Full or partial dentures consist of a gum-colored base made of plastic resin, which fits over the remaining alveolar (bone) ridge that formerly held the teeth. The prosthetic teeth projecting from the base are designed to look and function just like your natural teeth. Dentures are held in place primarily by the suctioning effect of their close fit against the alveolar ridges — that's why it's so important that they are fitted properly. The upper denture also gets extra support from the large surface area of the roof of the mouth (palate), which generally makes it extremely stable. At first, wearing dentures may require some getting used to in terms of talking and eating, as the dentures become “balanced” in the space formerly occupied by the teeth. But over time, the muscles, nerves and ligaments of the mouth learn to work in new ways, which allows these functions to occur normally. Dentures also help support the facial skeleton and the soft tissues of the lips and cheeks, which can help create a more youthful appearance. 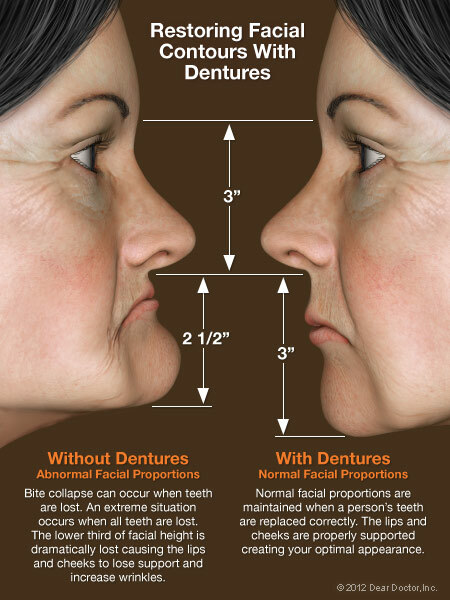 Immediate Dentures: These are usually a temporary means of helping you transition to successful denture wearing. Because of the muscular readjustment required, as well as the natural shrinkage of gums, the dentures which are placed immediately after tooth extraction won't fit as well as permanent dentures made when the healing is complete. They do, however, provide you with new teeth right away, and give you time to adjust. Conventional Full Dentures: After a period of time, permanent dentures that conform to your mouth with near-perfect accuracy can be fabricated. These are carefully crafted to look as much like your own natural teeth as possible, and are able to function properly in your mouth for a long time. Implant-Supported Overdentures: To increase the stability of a lower or upper denture, it's possible for it to be securely anchored using two or more dental implants. The upper jaw requires more implants (generally three or more) than the lower jaw due to a lesser bone density. Many people find this option offers a great balance of comfort, functionality and value. Transitional Partial Dentures: These relatively inexpensive removable plastic dentures serve as a temporary tooth replacement and space maintainer as you wait for your mouth to heal from tooth extraction, for example. Once the healing process is complete, dental implants can be placed. Removable Partial Dentures (RPDs): Usually made of cast vitallium, these well-constructed, metal-based removable partial dentures are much lighter and less obtrusive than those made of plastic. They are a little more expensive than plastic dentures but will fit better. They are, however, much less expensive than implants or fixed bridgework. Making quality dentures is a blend of science and art. First, an accurate impression (mold) is made of the alveolar ridges on the top and bottom of your mouth. The base of the denture is made from this mold in a dental laboratory. Working together, the dentist and lab technician choose from among many different sizes and shapes of prosthetic teeth to re-create a natural-looking smile. When everyone is satisfied with the result, the temporary dentures are made in permanent form. To enable normal speech and eating, it's crucial to balance your bite. This means that the upper and lower dentures come together and properly stabilize each other. 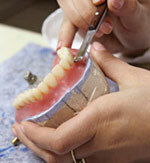 The form and function of the dentures are carefully checked to ensure that they are working and fitting properly. If you've recently lost your teeth and received an immediate denture, it's normal to find some tissue shrinkage and bone loss occurring. 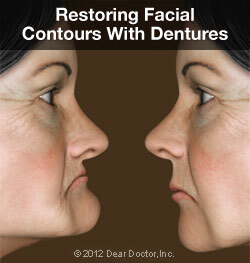 Therefore, in several months you may find that your immediate dentures no longer fit well. You will have two choices at this point: You can have your immediate (temporary) dentures re-lined. This means that material is added under the denture's base to better conform to the new contours of your alveolar ridge. A better option is to move to a set of conventional full dentures, which will last longer and fit better. With proper care, dentures offer a functional, aesthetic and economical solution to the problem of tooth loss.